I finally presented my qualifying project to the faculty and got some great feedback. After close to 2 years, this is way overdue. I was told that my study exceeded the requirements but I knew that all along. During my research proposal meeting (a long time ago), I wanted the faculty to limit my research scope, but they insisted more and more, and now they tell me that it is great and it exceeds expectations…but all I wanted was a short (like 6 months) and just good-enough project. Anyway, it’s over now. The two stacks of paper in the picture: the bottom stack is my research paper, the top is my presentation powerpoint notes. Now that the qualifier is over, it’s time to switch over to the dissertation proposal. I’ve added more RAM to the macbuku, and I’m learning to edit videos with this book, iMovie 6 & iDVD: the Missing Manual, in preparation for my dissertation research. It’s going to be an interesting research study. 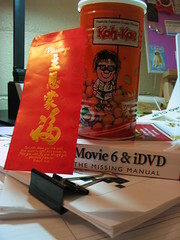 I received a nice CNY and birthday e-Amazon.com angpow from Victor. This year, I don’t think I’ll use that to get a kitchen appliance/cookware. I’m thinking of the Nike+iPod sport kit. But I haven’t been out running for almost 3 months now. This new gadget may motivate me to run again…or not. 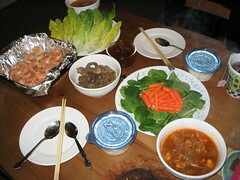 It was a wrap-beef-in-lettuce sort of meal. Simple yet delicious. I was so busy the last few days with draft/revisions – the last thing on my mind was to get the car out of the snow. So I put the chore aside and the snow-plough truck left a mountain of snow behind the car. 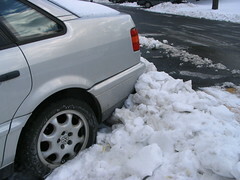 After a few days, the snow became heavy compacted snow-ice. This afternoon I spent an hour digging the car out. After today’s experience, next time I’ll do the digging immediately, when the snow is still light and fluffy. I’m going to have two very sore arms tomorrow. 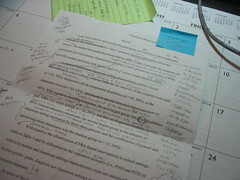 This has been my life for the past few weeks – drafts, revisions and more revisions. I’ll save my words to revise the method and results sections. 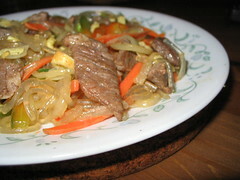 My first attempt at making jab-chae. It turned out pretty good. But I do believe I need some food photography tips from Aaron. Not the finish line…I’ve been really busy finishing my qualifying project: writing, feedback & revisions…sss, reading, excel sheets, SPSS analysis, significance, tables, APA format, reference list, article list, meetings with advisor; and at the same time trying to get started on the dissertation process. Overwhelmed but still under control. Let me not become weary in doing good (or my qualifier) for at the proper time (February 23) I will reap a harvest if I do not give up. That’s the message from Dr Wangari Maathai – the 2004 Nobel peace prize laureate for her Green Belt Movement. 1. When asked about domestic violence, she said that some people are poor – not “money” poor but poor in spirit. And that people can be so poor in spirit that they hurt those that they are supposed to protect. 2. It takes 10 trees to process the CO2 that a human being produces, if you haven’t planted a tree you’re using some other person’s trees. So go plant a tree. 3. She referred to the book of Genesis in the Bible and commented to the audience, “Even if you have not read the book of Genesis before, you should know the story, right?” I wonder what’s the percentage of people in the audience knows the story of Genesis. Anyway, she said that God created the earth, the plants and the animals: after each day of work, God said, “It is good.” But when He created Adam, He didn’t say it is good 🙂 Her enlightening genesis joke was that if God had created Adam on Tuesday, Adam would be dead by Wednesday – because man depend on all things that were created before him to survive. 4. Majority of the conflicts in this world is related to natural resources. If we do not learn to share and manage our limited natural resources wisely, things are going to get worse. 5. Not all of us can/will do big things, but we can all do the best we can.